Two built-in stereo speakers with double bass vents put you and your laptop in the center of an immersive media sound zone. Chill out with your laptop on the couch or bed and unleash sound so full, rich and deep, it's like you're listening to music and movies through high-quality external speakers—but without the hassle of disconnecting and carrying speakers from spot to spot. Logitech's Speaker Lapdesk is designed to keep you feeling relaxed and comfortable—even during those marathon movie sessions. 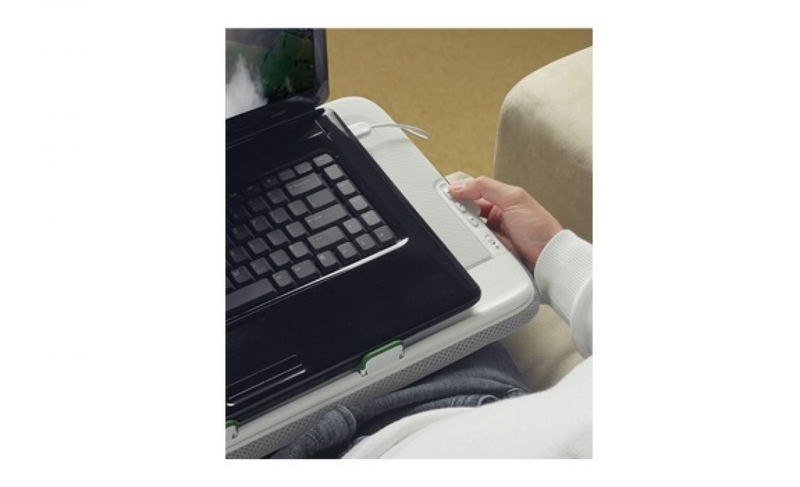 Thanks to the cool mesh padded base, your laptop can rest more comfortably on your lap in virtually any sitting position. 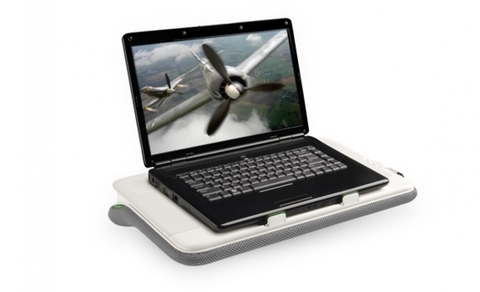 It even holds your laptop securely in place with integrated laptop holders and adjustable “sticky feet” tabs. So you can change leg positions without worrying about your laptop sliding around. 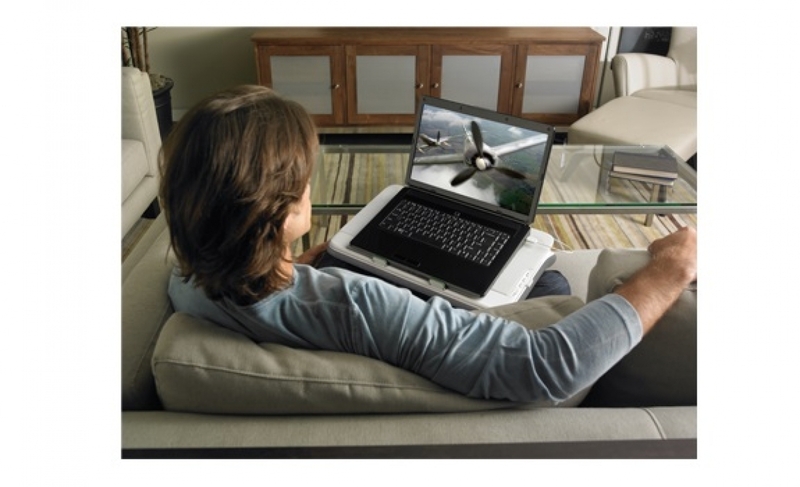 Using your laptop for long periods of time can radiate unwelcome heat onto your lap. 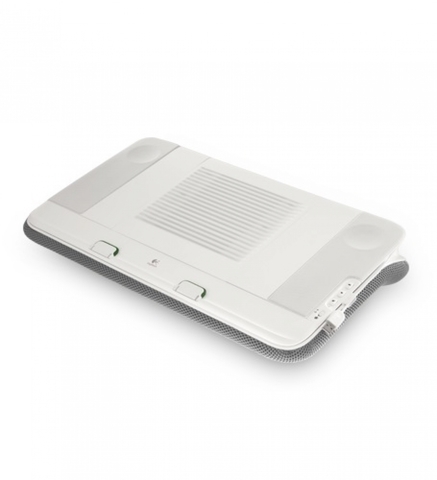 That's why your Speaker Lapdesk is designed with both a low-power cooling fan and a heat-shielding bottom. The fan pulls in and circulates cool air under your laptop to cool it more efficiently. And since the integrated fan is nearly silent, you're able to just listen and enjoy your music and movies without any distracting noise coming from your lapdesk. What's more, a grill protects the fan from damage while rear and bottom air intakes ensure steady, unobstructed airflow—even on cloth surfaces like your bed comforter. No batteries to install. No software to load. No complex instruction manuals. This is as easy as it gets. The Logitech Speaker Lapdesk works with any Microsoft Windows powered laptop or Apple MacBook up to 16 inches. A single USB cable connects the lapdesk to your laptop. It's that simple. Just plug in the cable to one of your laptop's USB port to power the speakers and fan. Say good-bye to finding the buttons on your laptop to adjust the volume. A conveniently located toggle button puts your volume controls (Up, Down, and Mute) within easy reach. Go ahead and crank it up! The maximum volume from this lapdesk beats built-in laptop speakers by a mile. You also have a convenient on/off switch for the fan to use it when you want. The Speaker Lapdesk is engineered to not only give you a superior audio experience. You'll also love how it looks in your home. Clean lines, smooth curves and the contoured shape complement any room. 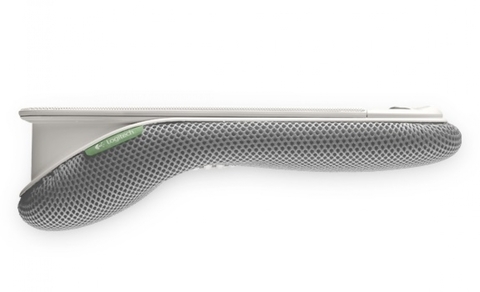 It's smart design that fits your lap, your life, and your style.